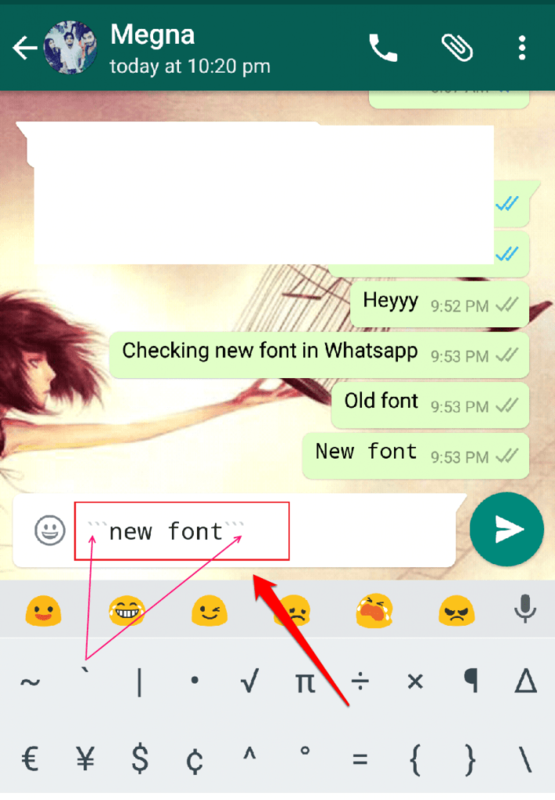 How To Send Your Whatsapp Messages In A Different Font:- Whatsapp messenger is the most widely accepted chat application by the people across the globe. It has got many striking features already. But Whatsapp always believes in continuous improvement and every other day it brings in a new feature for its users. Recently, we saw Whatsapp introducing some text formatting methods like bold, italics and strikethrough. Today, in this article, we are going to introduce you to the brand new text formatting feature that Whatsapp has introduced for its users. Using this feature, you can change the font of the text messages that you send to your friends. Read on, to learn all about this simple trick. First of all, open the chat window of the person to whom you want to send the message in a different font. Click on the text entering area. The keyboard will be shown to you then. Find the special character (`) that is shown in the screenshot given below. Click on it thrice. Once you have entered the specified special character thrice, you can enter the message to be sent in a different font. Once the message is over, type in three more of the special characters. 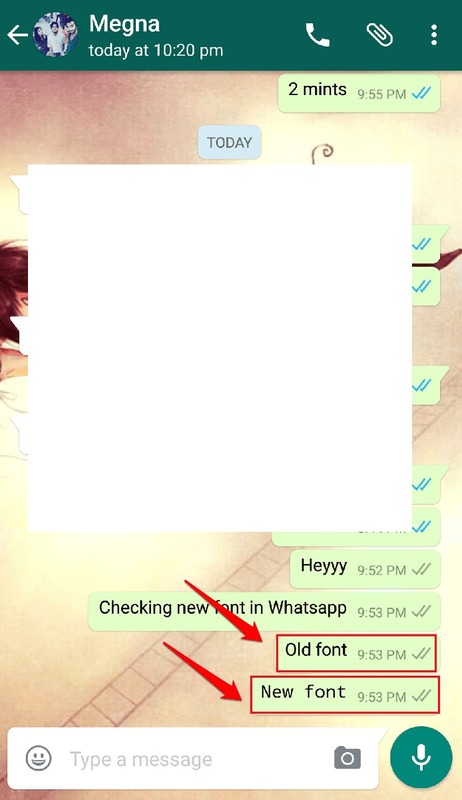 When you are done with the format of ` ` ` YourMessage ` ` `, Whatsapp will show you its formatted version. All you got to do now is hitting the Enter key and the message will be sent in the new font! If you are unable to send the messages in the new font or if you are stuck with any of the steps, please leave comments. We would get back to you as soon as possible. 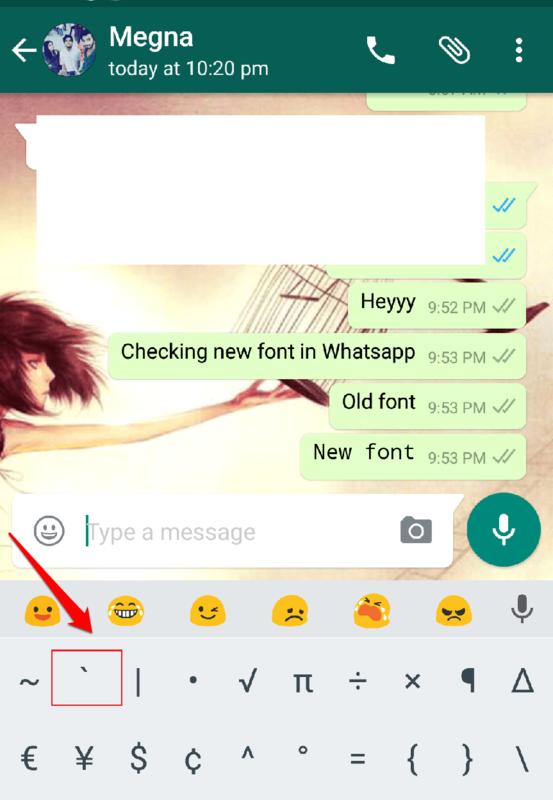 There are a lot more Whatsapp tricks that every Whatsapp user should be quite familiar with. You can check out our article on the topic 27 Secret Whatsapp Tricks You Never Knew to discover a whole pack of Whatsapp Tricks. Stay tuned for more tricks, tips, and hacks. I saw an add in Facebook with a whatsapp link to contact that person. And when i click on that whatsapp link, it took me to his personal whatsapp with an automated message that ” i want to get more info on your product ” . Can i know how to set that. Thank you for very useful information. Please teach me how to send individual person name, say his dues amount, due for particular Financial year and other variable text (which are all saved in an xls file) through WhatsApp Broadcast?